How to strip double quotes while importing data from CSV or TSV using SSMS Import Data wizard OR SSIS? 1) You are using SSMS Import data wizard to load data from a comma (or tab) separated value (CSV/TSV) file into SQL Server Table & you find that your source data values has double quotes and so you want to strip them before loading to destination table. 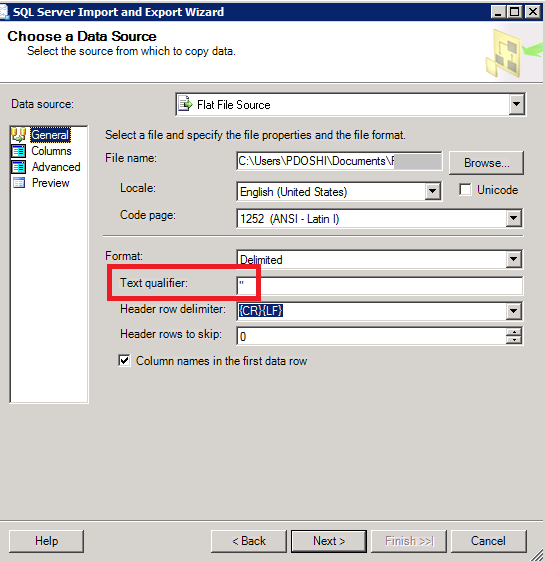 2) You are using SSIS to load data from a CSV/TSV file into SQL Server Table & you want to strip the double quotes in source table fields before you load the data to destination table. 1. After you’ve configured the Flat File connection. you’ll reach to a point where you’ll see “Flat File Connection Manager” in SSIS. Or in the SQL Server Import & Export data wizard, you’ll see a dialog box to configure flat file connections. 3. Make sure to Preview the data to verify that the double quotes around data fields have been trimmed. 4. That’s it! You’ve successfully configured the flat file connection manager to strip double quotes. SSRS in SharePoint mode: Data alert & Subscribe are grayed out or disabled.